Associated Press Pruning fruit trees will keep them healthy and help them bear bigger, better fruit. The central-leader tree is shaped much like a Christmas tree, with a single leader – the trunk – flanked by shorter and shorter side branches moving up the tree. The open-center tree is vase-shaped, with three or four main limbs growing outward and upward. The modified-central-leader tree is a hybrid that starts as a central-leader then becomes open-center. All these forms allow a tree to “harvest” enough sunlight. The ideal form for a particular tree depends not only on your whims, but also on the plant's natural growth habit. Begin pruning any new tree by cutting back broken stems and dead or diseased wood to healthy tissue. If your new tree is but a single stem (called a “whip” by nurseries), shorten it by one-third to promote branching. If it is already branched (the “feathered tree” of nurseries), save well-placed stems and completely cut away all others. Once a fruit tree is mature and beyond the training stage, then pruning it well means striking a balance between shoot growth and fruit production. How to achieve this balance depends on how – or really where – a particular tree bears its flowers and how big its fruits are. Especially with large fruits, such as apple and peach, individual fruits tend to be undersized and less sweet with too heavy a crop. 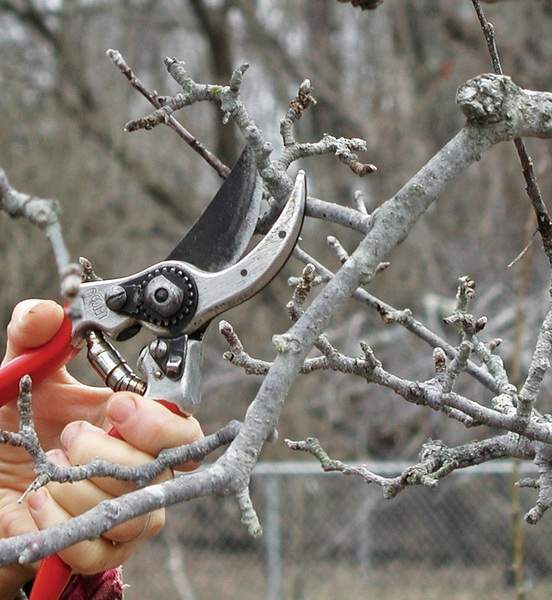 Pruning also removes some potential fruits so the plant can pump more energy into those that remain. At one extreme are peach and nectarine. They bear fruit only on stems that grew the previous season, so they need fairly severe annual pruning to stimulate an annual flush of vigorous, new shoots for the following year's crop. Prune enough so that a bird could fly right through the branches.